The world of tablets has, for pretty much any user that might want one, been pretty limited. The iPad was the only show in town for quite some time, and only recently have a few Android tablets emerged that can stack up to Apple’s offering. Of course the name of the game so far has been to cram as much computing power and features into the devices as possible, to make them as close to a grab-and-go replacement for laptops as possible. 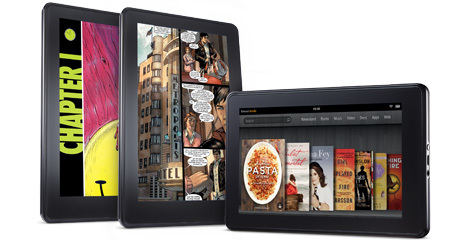 Today though, Amazon held their own very Jobsian keynote to announce their new line of Kindles, which along with the redesigned and sharpened e-ink devices you’d expect, features a new color/touch tablet called the Kindle Fire. You can take a look at it at Amazon. The Fire at first glance would seem like any under-powered iPad competitor, but the device is actually much more intriguing, especially if you are looking at it from the perspective of being a media consumption device, and the price tag… $200. It’s quite possible that Amazon just made a killing move into the game that so many companies want to win right now, and that’s the game of feeding you media. First of all, while the screen is smaller than the iPad 2’s (7 in VS 9.7 in), it boasts the same resolution for a sharper overall image, it’s also very light with a rubberized back and a entirely wireless syncing. Make no mistake, this is not a processing beast that can compete with the iPad 2 on the gaming and productivity front, but if you’re looking for something to make movie-watching more mobile, then the Fire brings a lot of other things to that table. Most importantly is that the tablet is fully integrated with Amazon’s cloud service and streaming offerings, and apparently has a wonderfully snappy and pleasant UI for accessing media. As you’ve probably heard, Netflix has been shitting itself on multiple fronts recently and seems on the cusp of dropping the ball completely. If it’s not the price hikes, the company split, the shuttering of “saved” queues, and the increasingly iffy streaming offerings, it’s the general sense that other services are quickly stepping up to the plate and landing great partnerships. Amazon recently signed Fox and nearly 2,000 of their titles to their streaming service, and that is likely to be the first of many as more companies seek to undercut Netflix and pimp their wares on Kindle’s devices. Now that Amazon had boldly stepped up with the Fire, Netflix is going to look even sillier for their moves as of late, and I think a lot of folks are going to start considering a nice Christmas present for themselves that includes a shiny, but affordable new tablet and a subscription to Amazon’s quickly growing streaming service. 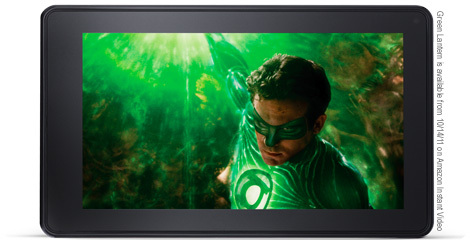 So here’s a full color touch tablet that is integrated with a quickly growing library of movies and music from the one of the biggest retailers on the planet, and it only cost $200? Apple finally has a reason to fear their competition, and the studios have another exciting avenue for on-demand revenue. 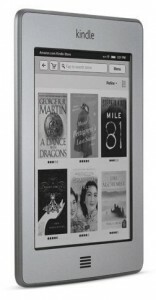 As for the consumer, I know I’m truly contemplating the idea of having a mobile movie-watching device, as I could buy the Fire and one of the updated e-ink Kindles for significantly less than an iPad 2. The Fire has a few other progressive, interesting tricks up its sleeve too. The online browser on the tablet is called Silk, and represents a real step forward towards cloud computing. The program allows you to surf large, intensive websites on a mobile device faster than ever before by farming out much of the intensive rendering and processing to Amazon’s cloud servers. The device marks the first time a tablet will be a true hybrid of local processing and cloud computing. Add those features in with the price and the media-friendly design and you’ve got the possibility for a game changer. Amazon is going to have a nice Holiday season.